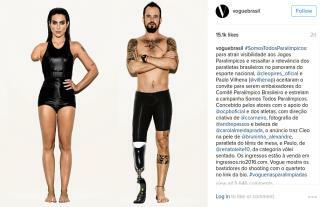 (Newser) – Vogue Brazil is taking heat this week after Photoshopping physical disabilities onto models for a Paralympics promotion instead of using actual amputees as models. The BBC reports the fashion magazine posted the offending image to Instagram on Thursday. It features models Cleo Pires (with her arm erased) and Paulo Vilhena (with his leg replaced by a prosthetic). "What were Brazilian Vogue thinking, it's completely and utterly wrong," disabled model and activist Chelsey Jay says. She says it's incredibly difficult for models with actual disabilities to get work. "The media think that it's OK to pretend that able-bodied people are disabled, and that's not OK," Jay says. Get ready to lose subscribers big-time, Vogue. What goes around comes around. WOW! Vogue Brazil just got FREE ADVERTISING for it's WEB site &printed Magazine! Advertising~~ the act or practice of calling public attention to one's product, service, need, etc., especially by FREE announcements in newspapers and magazines, over radio or television, on billboards, etc. : to get more customers by advertising! Smart People they got there! There ya go ALL!! What's next - put white models in blackface so they don't have to use black models?